I started my travels when I was about 7 years old. My father, a former NHA employee, would always bring me and my brother to his travel escapades. He took us to several family reunions in Pangasinan and in some parts of Zambales. But the one trip that I will never forget was the one in Baguio. I remember it as one of the most memorable of all the trips that I've been to. Spending a few days in this pleasantly cold place was an adventure on its own. And traveling as a kid by land, on an approximately 6 to 7 hour trip was pure bliss. Except for those two times that I had to bawl my brains out, I still enjoyed the long bus trip. Drinking Sprite actually helped me to feel less light-headed during the trip. Experiencing Baguio as a kid made quite an impressive memory. 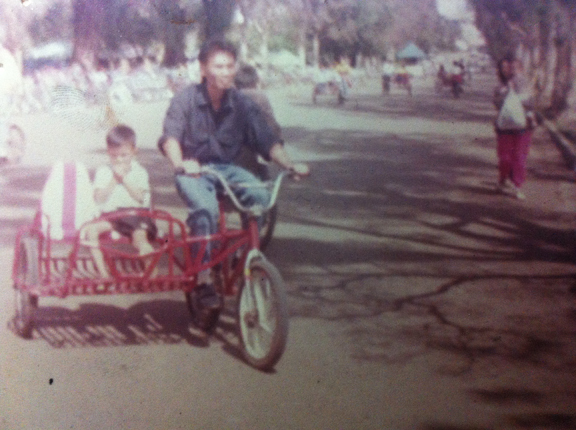 I remember photos taken of my father driving the bicycle with my then 3 year old brother, somewhere in Burnham Park; and posing in front of a film camera, while my knees jittered by the overlooking area of Mines View. I also recall what may have been a hundred steps, going all the way up to the Baguio Cathedral; and enjoying lunch at Barrio Fiesta with family friends. Since then, I’ve made five more trips to Baguio throughout my years. Then again, those trips have their own stories to tell. But through that first real adventure, will I always thank my father. For he helped me embrace the wanderluster in me. Baguio is always a favorite vacation destination for me as well. Lucky for me I have a friend who lives there and accommodation are sometimes free if indeed I booked earlier among their other usual visitors. I've also been there for some work-related trips. Really? Go there this June, magpalamig ka na lang although baka maulan na by then.. 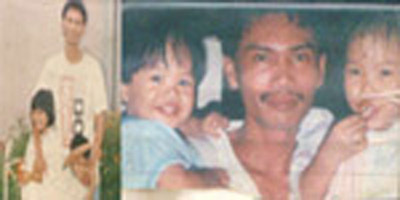 I lost my father 17 years ago naman.. and every time I travel, lagi ko siyang naaalala.. Beautifully written post. Baguio, indeed, is a haven for most vacationers. I studied in Baguio and I understand how you feel. Have you been to the asin hot springs not far from Baguio? or the Maryhurst and Pink sister's. Parang nasa ibang bansa ka, lalo na pag foggy siya. Happy traveling :) I'm hoping to travel to Baguio, too! Any ghost stories to share? It was my dad too who instilled in me the love to travel. Every time he's away I'd get a postcard from him of wherever he goes. Greece, Hamburg, Amsterdam, Norway, name it and he'll send me one along with a photo of himself...His gesture made me interested in geography and history a lot...it was with pure regret that I wasn't able to bring him to Vienna before he passed away. :( But I'm sure he had a longer list of the places he saw compared to mine...miss him! kudos to your dad for raising the budget biyahera the way he did! our parents do have lasting influence on us + in our lives, long before they are gone....one of my father's legacy is the gift of reading + i would like to be able to pass it on to my son, too! iLIKE ur tagline explore and be free.,.. iba talaga pagkasama mo ang parents mo sa bawat journey ng buhay mo. Sobra AXL! Makes me miss my dad even more..
parents always want the BEST for their children. if only they can give everything that we wish to have or places we wish to go... they would find a way. yay! i envy you for being a traveler since then..me?i grew up with my grandpa ;) and my stuff before with him include 'sabong', 'sabong' and 'sabong'..hahahahaha.. I'm a papa's girl too and I can relate to your sentiments. Sometimes, we can only wish for time...we will always remember that time spent together. I feel for you sis.. I actually wish that my father lived a little longer.. I wish we could travel with my father more. Lagi na lang siyang trabaho. But we usually join their company outings kapag summer. But traveling on our own as family, bihira lang. Now that I have a family of my own, I try to include him in our vacation. i remember going to baguio na lagi akong nahihilo. i had motion sickness when i was a child kaya mabibilang din lang yung times that i go there. i just wish mabalik nila ung dating baguio; malinis, malamig and friendly ang mga tao. that is very touching, i just recently lost my dad this year and it was very painful and hard for our family.. Thanks for sharing your memories with your dad! For sure he's smiling reading your post in heaven! He was so young!!! He's too young... "Gone too soon." But I'm sure, he's happy wherever he is now because you continue to explore the world he had left at a very young age of 35. If you don't mind my asking... what caused his early demise? Reading this made me think of my own father. I expect to write another post about him this coming month because it's his birthday. We never really forget even if they have long been gone. Sad naman ao bigla. 7 years lang pala age gap namin ng father mo. You are lucky to have those fond memory from him.I never had those kind ofmemory from my father. if meron man ,hindi ko maalala. Napakabata ba ng dad mo ng kinuha ni Lord. Nevertheless, He had opened your eyes to what you are now a good traveler. Sayang, ang late dad ko kasi is more of a home-body person. At least your father kept an integral part in you which is your love for travel and Baguio being my hometown is always a nice place to travel. It's amazing how our childhood affects who and what we are today. Your dad is very proud of you, I'm sure. Thanks for sharing this personal story of both your family and the beginnings of your traveling bug! :) Oh, I've only been to Baguio once, 4 years ago, and I distinctly remember having nothing but strawberry taho for the meals on my first day there. Budget Byahera has grown in terms of journey and following through the years. Cheers. Aww that's a touching story of how you are empowered to start with all your travels. I'm deeply touched. I appreciate your blog posts more thinking that each of them is tied with someone you love. wow! so that's how the traveler in you came about :) I love Baguio too, its a place I will always been wanting to go back and visit. Great to know your father is a traveler by heart too. going with him through reunions and everywhere else shows much he loves you. Moments with fathers are worth to cherish. Thanks for sharing the birth of this post/blog. What a lovely story this is Mai Flores. Thank you for sharing with us. Revisiting again this very inspiring post. Just want to share a thing, My late dad once told me that "Daddy's girl or boy" will grow up more independent that children who are more 'motherly' attached. Laki talaga ng influence ng dad mo sa iyong travel life. I was three years old when I first visited Baguio with my family and like you I experienced biking with my dad. These are precious memories I'd cherish all my life. A very nice story. I hope I had the chance to travel with my father also. He died early kasi so I only have few memories of him (I was just 9 years old then). Your father started your love for travelling and I'm sure he's guiding you in every travels you make these days. I've been to Baguio once palang and I am planning to bring our family there before the year ends. Awww... thank you po tay! :) Salamat po for that insight. At least we still had some good years with our fathers before they passed. My dad passed away when I was 11. So cute naman po the one with a sidecar bicycle. And it was also cool to know that you continued what your father been started. .keep it up! Oh, that's how things started for you. Nice to see you and your father at the above photos, timeless indeed.